The American Qur’an project is one of the most surprising art exhibits I’ve ever come across. 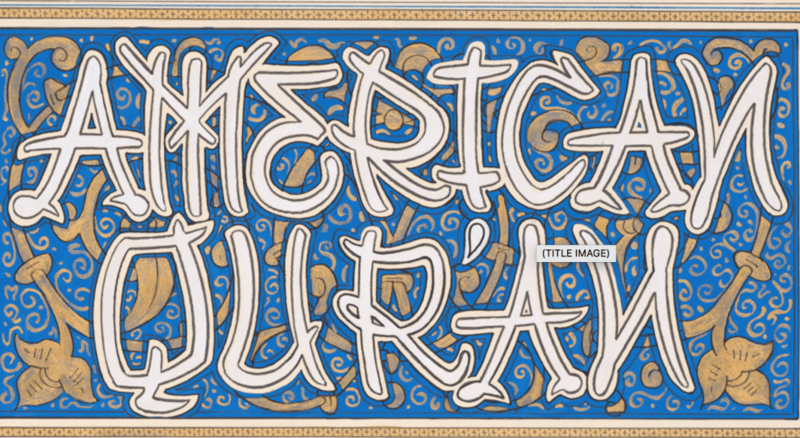 It’s one artist’s rendition of the Qur’an juxtaposed upon relevant scenes of American life. Sandow Birk is the L.A.-based artist who was inspired to hand-paint the scenes and transcribe the Qur’an text in English. After traveling extensively throughout the Muslim world. At the moment, the exhibit is displayed at the Sabeel Center in suburban Chicago (8800 Ballard Street, Des Plaines, IL 60016). It’s on display until September 28, 2018 and can be viewed via tour by appointment only. To scheduled a tour, email the Director, Rizwan Kadir: RSVP@sabeelcenter.org. I was intrigued by the project first and foremost because as an American who converted to Islam nearly 18 years ago, I find myself constantly answering the question as to why I became Muslim and often times being told that it was such a foreign concept- a religion only practiced in “the East”. That is certainly not the case, and as the world becomes more and more globally connected we see and hear stories of countless converts from Western countries who live everyday lives practicing Islam while living and co-existing peacefully within the culture(s) in which they were born- such as myself. Sandow’s work is a reminder to me of many images that simply bring back that feeling of Americana I grew up with: family picnics on the 4th of July; Latino neighborhoods with the corner stores; Asian neighborhoods where anyone can visit and see the Chinese New Year parade. Things like this are American. I am American. And Muslim. And Latina. And Italian. Does it all go together? Of course it does. Especially at a time like now when we are seeing so much vile behavior towards “the other” in public (i.e. the refugees, Latinos, Muslims, African Americans), I think this work is not only culturally significant; it’s also politically poignant, whether he meant it to be or not. I could say more, but tonight I’ll attend a closing night event and hopefully get a copy of the printed book, signed by the artist himself and giving one copy away to one random reader here. Read more about Sandow Birk and the American Qur’an project here. To enter to win, leave a comment below with your thoughts on the project and why you would like to have the book. This entry was posted in American Qur'an project, art, artists, Book Reviews, Books, Giveaways, Qur'an, Sandow Birk, Yvonne's Blog. Bookmark the permalink.